Born Michelangelo Merisi, the painter took the name of his birthplace, Caravaggio, a town in Lombardy, Italy. As one of the most puzzled and tumultuous lives of art, Caravaggio produced work both deeply human and intensely religious. His graphic depictions of religious figures caused great offense during his time, as much as he became the most famous artist in Rome of his time. He has also captured the imagination of the art world in recent revivals of his work. Orphaned at a young age due to the ravenous plague, the painter found his first studies under Simone Peterzano (1540 – 1596) in 1584, influenced by the work of Titian (1485 – 1576). Caravaggio’s earliest works became known after he joined the workshop of Giuseppe Cesari (1568 – 1640) in Rome. His main task was as a painter of fruits and flowers, producing pieces such as, Boy Peeling Fruit and Boy with a Basket of Fruit from 1593. One of his early works, Young Sick Bacchus is said to be a self portrait done in illness before ending his time in Cesari’s workshop. He later painted another piece depicting Bacchus, the Roman God of Wine, in 1596 which is now in the Uffizi Gallery. After this the artist sought his own path, going on to form friendships with influential artists of the time, including the Italian architect, Onorio Longhi (1568 – 1619). Together, they were a riotous pair and where famously involved in brawls, one in which lead to a trial for murder. This sent Caravaggio on the run, seeking sanctuary, which he found in the Colonna family, powerful friends connected to his mother, just outside Rome. Though, before this he created passionate works that revealed a revolutionary artist. His pieces depicting Saint Matthew and of the Madonna, also The Sacrifice of Isaac, The Crucifixion of Saint Peter, Amor Victorious, The Entombment, Death of the Virgin, all caused a great stir in Rome. Perhaps most famously, are his realistic portrayals of Saint Matthew, in The Calling of Saint Matthew and The Martyrdom of Saint Matthew. His refugee with the Colonna family then garnered him several commissions, from which he created work such as, Madonna of the Rosary and The Seven Works of Mercy. Though he did not stay long, still fearing retribution for his past crimes, and fled to Malta and then to Sicily. All throughout gaining commissions in a fevered outpouring of painting, producing the Beheading of Saint John the Baptist, Portrait of Alof de Wignacourt, Burial of Saint Lucy, The Raising of Lazarus, and Adoration of the Shepherds. The artist is documented to have lived in fear, expelled from Malta and later attacked in Naples. Even after receiving a pardon from the Pope himself for past acts, the artist was again wrongfully imprisoned. 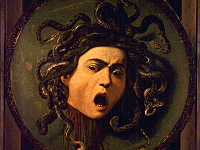 Famously, the painter’s life inspired his art, creating a piece, Salome with the Head of John the Baptist, which showed his own face in place of John. With the work he sought to receive pardon from his expellers in Malta, but in the end died en route of its reception in 1610.